Update Reports from the Wickford Junction Station groundbreaking state that the FTA announced that they have just authorized the release of nearly $2M in federal funds to RIDOT for preliminary engineering of a proposed MBTA commuter rail stop in Pawtucket. WPRI has all the commuter rail details from the groundbreaking today of the Wickford Junction Station. The MBTA plans to make three round trips daily between Boston and Warwick when the airport station first opens this fall. That will increase to eight by the time Wickford opens next year, according to R.I. Department of Transportation spokeswoman Dana Alexander Nolfe. The number of passengers using the Wickford Junction station daily is forecast to rise from about 1,500 when service starts in 2011 to 1,669 in 2020, according to projections made in 1995 and cited by state planners. An additional 240 commuters are expected to use the Warwick station. A ticket from North Kingstown to Boston will cost $9 each way, and a monthly pass will cost $280, Nolfe said. To go from North Kingstown to Providence, a one-way ticket will cost $2.75 and a monthly pass will cost $101. One-way trips from Warwick will cost slightly less – $2.50 to Providence and $8.25 to Boston. Officials hope the airport station will be ready to open in October. That project’s final cost is estimated at $267 million. The Wickford Junction station is set to open sometime next year. 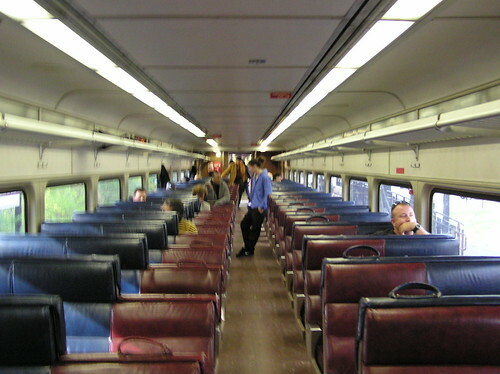 In addition to Wickford Junction, MBTA service is being considered for the Kingston and Westerly Amtrak stations, and at new stations in Pawtucket, Cranston, and East Greenwich. Ted Nesi from WPRI also spoke with Senator Reed about the long process of making this station happen. It actually started with Senator Pell, remember him? No, neither do I.